This page reads more like a history lesson, I can't believe the old photos, especially the black and white. But it is a part of who I am, or at least, was. As you know, I'm now a writer. I've been a regular columnist for The National Post, have written for Readers Digest, MacLeans Magazine, and other publications, and have been syndicated by the New York TImes. I've completed two screenplayes, and have three book projects on the go. Will try to keep you up to date on my blog. 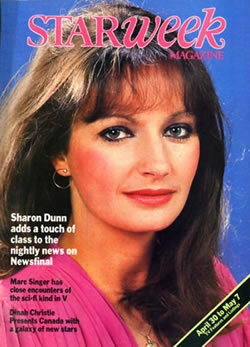 Sharon Dunn is the most widely watched news anchor in the history of CBLT-TV News (CBC Toronto). She took programming ratings to their highest levels ever. Sharon has 20 years experience as a Broadcaster: TV News Anchor, Host, Interviewer, Reporter, Analyst, Writer, and Story Editor. Sharon's career in television began at the age of 14 when she snagged a reporting job on the local CBC station after challenging a radio reporter during an interview about a dance at her high school. During her high school years at Holy Angels in Sydney, Nova Scotia Sharon became well known as a debator with a sarcastic wit and by the time she left high school was an award winning, still undefeated debator as well as President of the Student Council, Student of the Year, and Recipient of the Birk's Medal for Leadership. Sharon was hired as a story editor at CBC Halifax and over the next four years was the major TV news anchor, producing her own items for the current affairs show. Sharon transferred to Toronto and anchored CBLT's suppertime news program Newshour and the 11pm news show Newsfinal. During her time with CBC Toronto Sharon hosted election programs, news specials and did regular consumer and business interviews. Sharon left CBLT in 1984 to have a baby and learn the horse breeding business with her husband the late John Sikura. But Sharon did surface from time to time to do various TV Shows including the National Business Report, a nationally syndicated business program, and The New You, a nationally syndicated beauty show. 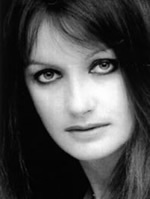 During this time Sharon also did a number of Industrial Films. More recently Sharon was host and senior editor for Today's Parent a nationally syndicated TV program which saw Sharon travel throughout North America to interview renowned child experts like Ron Taffel, David Elkind, Barbara Collaroso and Penelope Leach. Sharon's interest in education prompted her to accept an offer to host the Making Connections Series on TVO, which involved panel discussions and questions from viewers to Ontario's top educators. Sharon's interest in children prompted her to be keynote speaker at the Mother's Day Breakfast for Kids Help Phone and Host-Presenter with Kurt Browning for the Canadian end of the Muscular Dystrophy Telethon. Although Sharon does not see herself as an actress her vast television news experience brought her acting roles in such movies as HBO's Dead Silence and Closer, Closer -- playing a newsanchor/reporter. At this time, as well as raising her children, Sharon is a columnist at The National Post.